The terrible images from the WDBJ shooting in Virginia dominated Google searches over the last few days. Here's a look back at the week in search. A small TV station in Roanoke, Va., is reeling after two of its journalists were shot and killed live on air Wednesday morning. Police identified the gunman as a former reporter for the station, and if his horrible crime was designed for maximum shock and attention, it worked. Searches for Bryce Williams—the on-air name former employee Vester Flanagan went by—ran into the tens of millions as people looked for information and video of what had happened. Thursday marked 10 years since Hurricane Katrina devastated New Orleans, but searchers in the U.S. over the last 48 hours have been looking ahead to another storm. Today, news outlets are reporting that Tropical Storm Erika has already been responsible for deaths in the Caribbean island of Dominica. 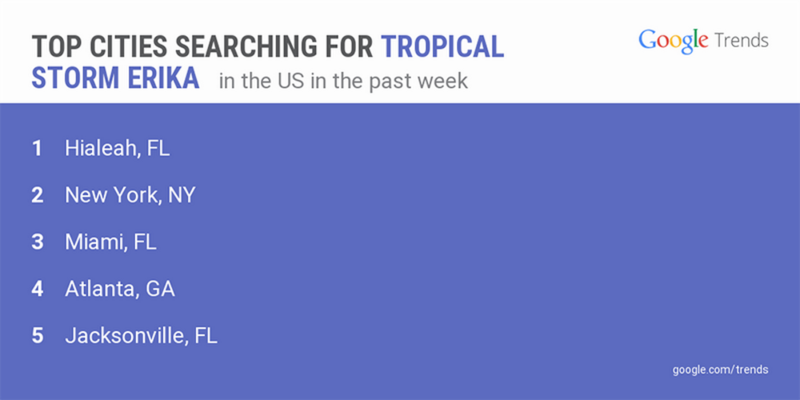 As Florida’s governor declared a state of emergency ahead of Erika’s predicted U.S. landfall Monday, the city of Hialeah in South Florida is the top of the list of cities searching for information on the storm. But whether the storm searches are coming from the U.S. or the Caribbean, “Erika path” and related terms are up more than 1000 percent this week. Get out the popcorn. MTV’s annual Video Music Awards is coming up this Sunday, and all eyes will be on Taylor Swift and Nicki Minaj following their much-buzzed about Twitter spat over nominations for Music Video of the Year. We turned to search to see if trends could show us whether people are leaning Team Swift or Team Minaj headed into the weekend. 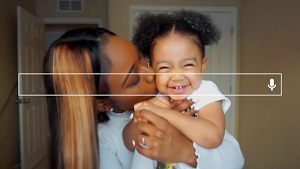 Tay-Tay’s music video “Blank Space” is in the lead in the Best Female Video category, followed by Minaj’s “Anaconda.” Though “Anaconda” was not nominated for Music Video of the Year—a category that Swift also leads for “Bad Blood,” according to Google searches—Minaj is top of the search pile in the Best Hip Hop Video category. In other music news, a report that One Direction will be parting ways up brought a 200,000 search spike earlier in the week. “Are One Direction splitting up?” (perhaps we should make that “ARE ONE DIRECTION SPLITTING UP??!?! :(:(:(”) was the top search question, before the band clarified they are actually just taking a break. As former band member Zayn Malik has already decided to go solo, we read the search tea leaves to see what kind of popularity the current members have should the band, well, disband. Most likely to launch a successful solo career based on search buzz? 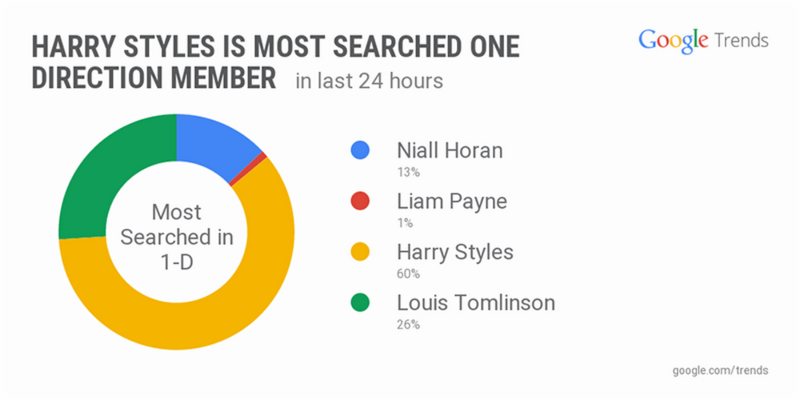 Harry Styles is the resounding winner, taking a whopping 60 percent of the 1D searches. Our advice for Liam Payne: at 1 percent, don’t give up your day job. Abbi Tatton searched this week for "roanoke va."